Okinawa Agu, a brand of pork distributed by the Okinawa Meat Center. Since last year, the company has been exporting their original pork brand of Aged Agu Pork and Okinawa Meat Center’s pork brand of Okinawa Agu, a total of 120 kilograms (264.6 pounds) per month to Citysuper, an upscale supermarket operating four stores in Hong Kong. They closed the deal with Sogo Hong Kong in mid-July and started exports from the end of the month. In future they will export 60 kilograms (132 pounds) of Okinawa Agu per month. According to the Okinawa Meat Center, Okinawa Agu contains a good quantity of glutamine acid, which is a component of the savory flavor. It has plenty of fat and a low melting point, so you can enjoy the sensation of the meat seemingly melting in your mouth. They have negotiated a two-year deal. In the background to the completion of the deal is that because imports of black Iberian pig from Spain to Sogo Hong Kong have decreased, the store has been looking for products to take the place of the Iberian pig and offered Maruichi Meat the opportunity to export the pork. Sogo Hong Kong has two stores in Hong Kong but Maruichi Meat will supply pork to the Causeway Bay store in downtown Hong Kong. In addition to agu pork, Maruichi Meat plans to export the Okinawa Livestock Promotion Public Corporation’s Masan Pork. 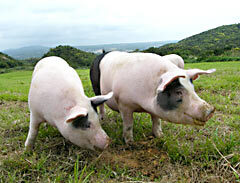 Because its price is 30 to 40% lower than agu pork, they are looking to supply Masan Pork to general supermarkets.